One of the most important aspects of traveling or being outdoors is making sure you always have charged devices. Whether it be a smartphone, a tablet, or a torch, you want to be sure you always have battery power available. You won’t always have access to a charging point, and that’s when the sun becomes your new travel companion. Enter, solar chargers. Solar chargers are your way of harnessing the sun and ensuring all of your devices and gear stay fully charged throughout your hike, camping trip, or travel adventure. Our favorite compact charger is the Dizaul Solar Charger. It is incredibly lightweight yet strong and durable. For a small charger, it packs quite a punch. It is ideal for packing it an emergency bag, a medical-kit, your camping bag or hiking pack. The small charger can easily top-up your phone or another device, or be an emergency source of power. 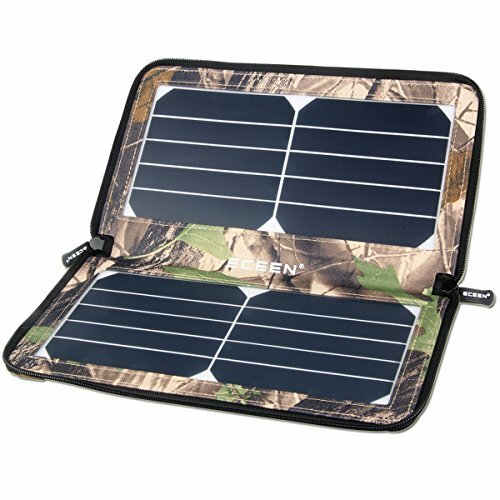 The most durable charger on our list is the Eceen Solar Charger. It is designed to be rugged and strong and be able to take a hit if it was to fall. 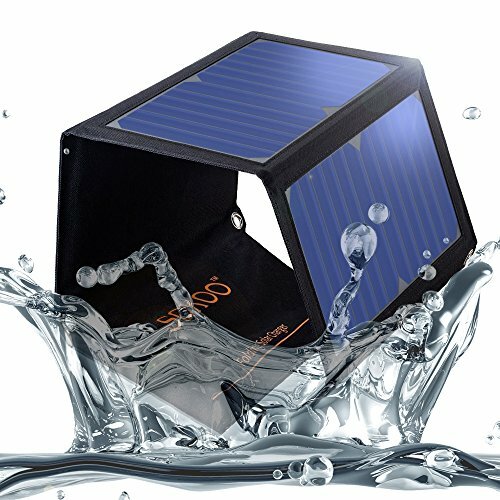 The foldable case design protects the interior solar panels from dust and water damage while making the device compact and easy to store. The best budget charger on our list is the Dizaul Solar Charger. It is incredibly well-priced for what it can do and if you are looking for something simple to do an easy job like just topping up your smartphone battery, this is the right choice for you. It’s rugged and strong, able to easily fit into any pack or jacket, and perfect for taking along with you, whether you’re traveling, hiking or camping. 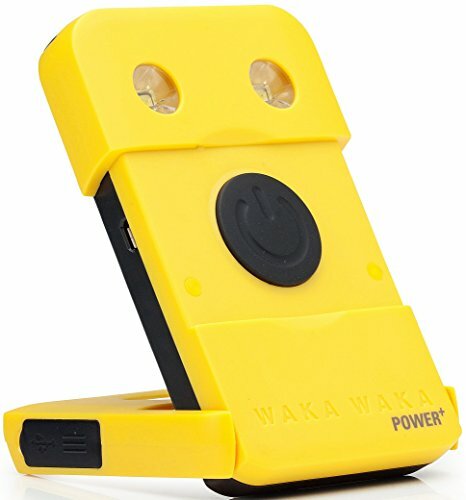 Our favourite emergency charger is the WakaWaka Portable Solar Charger. It is easy to use, easy to store and can help you out quickly when you need power the most. You can fit one into any size pack or jacket pocket, or even keep it in your home for when you need it. Store one in your car if you really get stuck somewhere without power. The best overall portable power is the Dizaul Solar Charger. Ticking many boxes such as being the most compact and the bet budget charger, it should be on every outdoorsman packing list. It is the ideal companion for any outdoor trip and can be a lifesaver if your device charger doesn’t work, you don’t have the correct adaptor, or you are stuck without power. 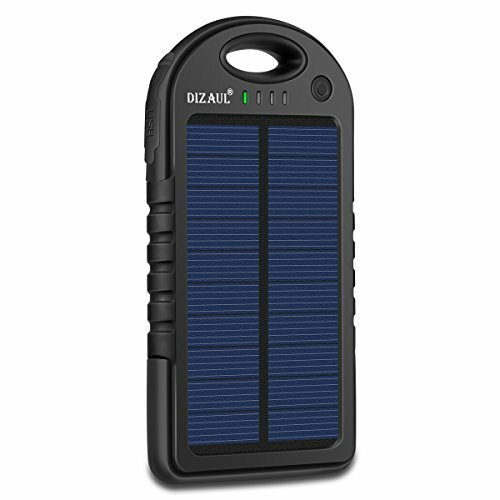 The Dizaul Solar Charger is a highly durable shockproof and water-resistant solar charger. It is made from eco-friendly silicone rubber and ABS + PC material, with a rubber pain surface process. The football grain design has anti-skid protection. The device is water-resistant, protecting it against unexpected rain falling water. The device is also shockproof, and will still work efficiently. The USB ports are very well-protected against dust and water, as they are covered with rubber caps. The 5V charging capabilities can charge smartphones and tablets, although charging a tablet or something bigger will take longer to charge. 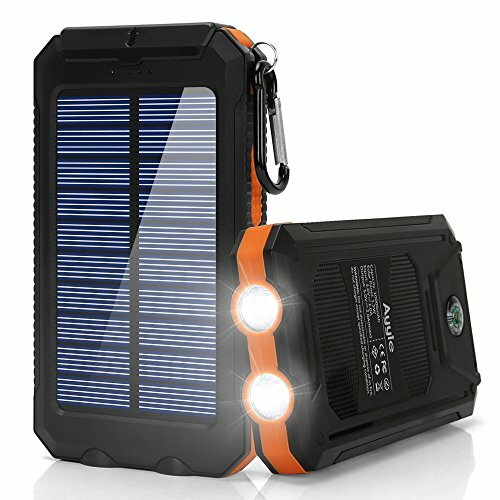 The Ayyie Portable Solar Charger is a water-resistant, shock-resistant and dustproof portable solar charger with a built-in compass and a 2 LED torch. The perfect companion for a camping trip, a hike, or even an emergency situation. The charger has dual USB ports, a 5V/1A and a 5V/2.1A outputs are suitable for most smartphones and smaller pieces of digital equipment. The 2.1A output is great for tablets. The charger also has Automatic Smart Identification. The device itself is made of durable, strong and reliable ABS + PC + Silicone material. There is a built-in compass to help with direction in emergency situations, and a carabiner clip allows you to easily carry the charger on your pack, allowing it to charge while you’re on the go. 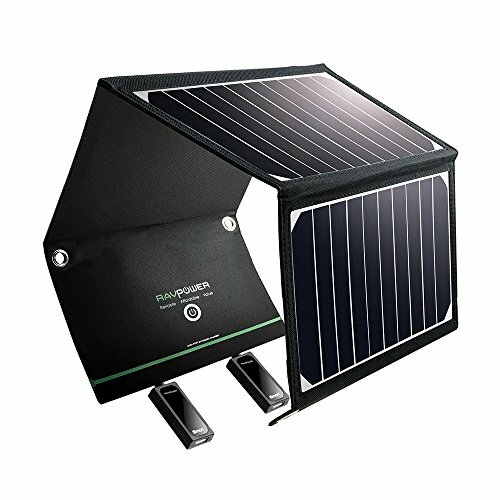 The RAVPower Solar Charger is a powerful 16W solar panel that has dual USB outputs, is waterproof, and has a compact, foldable design. You can easily fold it up and store it in your pack or your car. The panel is made from high-quality and extremely rugged polyester canvas. The canvas is waterproof, and weather-resistant, able to withstand harsh conditions and activities. The panel also has 4 hooks to ensure it captures the maximum amount of sunlight. The panel has a high energy conversion rate, converting most of the sunlight quickly and efficiently into usable energy. The panel will adapt to the device plugged into it, and ensure it receives the required charge it needs. The RoamProof Solar Charger is an incredibly durable and powerful solar battery. The 20 000 mAh battery is powerful enough to charge your devices efficiently, and the fast charging capabilities ensure they get charged quickly. The battery is fitted with 4 charging ports, allowing you to charge 4 devices at once. The battery has two 5V/2.1A ports, and two 5V/1A ports, allowing you to charge smartphones, tablets and other pieces of gear. The battery is part of a package that includes the solar charger, aluminium carabiner, 4 braided nylon, aluminium cased USB charging/data cables (2 lightning, 2 micro-USB) and 1 waterproof battery case. 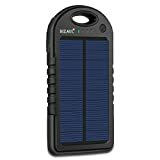 The Beartwo Solar Charger is a waterproof and shockproof, 10 000mAh dual USB solar bank, that is ideal for charging smartphones while out camping or hiking. The compact device can easily fit into a pack or your pocket. The device is Intelligent Dual-USB Output. You can charge two devices simultaneously, with a maximum output of 5V/2.1A. A full recharge can take as little as 4-5 hours with a DC 5V/2A charger. The device is made durable ABS + PC material, which is not only strong but also environmentally friendly. The device also has surge protection to prevent overcharging, power surges and overheating. 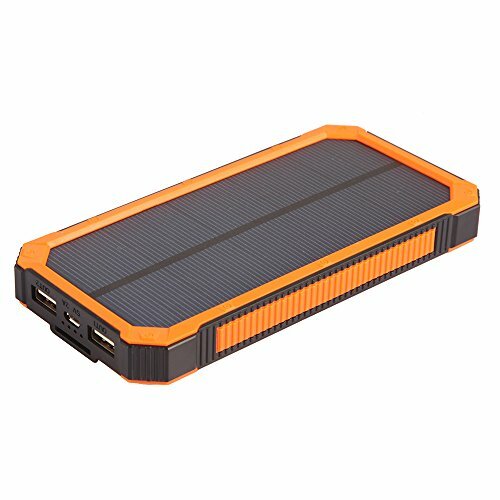 The Sunjack Solar Charger is a 20W charger that includes two 10 000mAh power banks to store power. The charger pumps out 2 amps of power out of each USB port, giving you the same charging speeds you would get from a wall plug point. The device is also fitted with Automatic Restart technology, which means even if cloud cover stops the device charging and it turns off, once the cloud moves, the device will automatically restart and start charging again. The charger is incredibly rugged and strong, but compact. It folds down into a package the size of an iPad, allowing for easy storage and transportation. The two power banks allow you to store power and use it whenever you need it. The Sokoo Foldable Solar Charger is a 22W, 5V portable solar charger. The reinforced device is perfect for carrying on your pack while hiking or camping. It is also waterproof in the case of your pack getting wet or dropping it in water by accident. The device has a built-in Smart IC chip, which intelligently and quickly identifies your device to ensure it sends the right power output, maximizing the charging speed. This also prevents your devices from overheating or overcharging. The device is very compact and allows for storage in a pack, small bag, or even in a jacket pocket. There copper-alloy eye holes that allow you to hang the device from your pack. The 18-month warranty ensures your device is protected from accidental damage. The Plochy Solar Chargeris a lightweight and compact 24 000mAh portable, solar, power bank that is ideal for hikers and campers needing a device that can top-up power on your smartphone or another smaller piece of gear. The device is fitted with both micro and lightning ports, allowing you to charge devices with either type of USB cable you may have with you. The device also comes with cables, in the event that you don’t have your own. The device is made with Quik Charging Technology. The charger will automatically detect the type of advice plugged in, and then adapt to charge it as quickly and efficiently as possible. Simultaneously charge 3 devices at once. 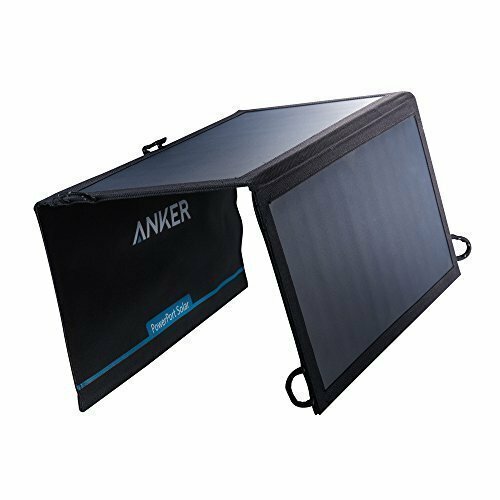 The Anker Solar Charger is a 15W charger that is able to charge most smartphones, as well as tablets. Even though it is durable and rugged, it is still quite lightweight and compact. You are able to easily store the charger in any size pack or jacket pocket. The device is fitted with Fast Charging Technology, which delivers an incredibly quick charge of up to 2.1 amps if the device is in direct sunlight. This also allows the panel to charge two devices at once. The charger panels are made of industrial strength, PET polymer. These panels are sewn into an incredibly rugged polyester canvas, allowing the device to be long-lasting and weather-proof. This charger by Eceen is a compact, 10W portable charger that is ideally suited for topping up the battery of your smartphone or smaller pieces of electronic gear. It is great for taking on a hiking or camping trip to be used as an emergency power source. The device is fitted with USB Smart Output. This built-in Smart IC automatically adjusts to whichever device is plugged in, to ensure that device receives its required amount of power without overheating or overcharging the device. The charger is small and compact and folds into an ultra-thin pack. The zipper pack design of the charger also protects the exterior solar panels from damp and damage while being carried or packed into a pack. The Soluser Solar Charger is a dual-charging, lightweight and compact solar charger designed to be used by hikers and campers. It is brilliant to hang onto your pack while on the move and top up your battery when you need it. The pack has a large 15 000mAh, built-in battery, which is able to charge most smartphones and smaller electronics. You can charge the phone using the solar panels, or with the battery pack. The device has two fast-charging USB ports, allowing you to charge smartphones and tablets simultaneously. The battery has a built-in LED light, perfect for emergency situations out in the field. This charger from WakaWaka is a small and compact solar charger that is ideally suited for emergency situations or quick power on the go. This device is able to charge a smartphone back to the full battery, or an action camera. The device has a 3000mAh battery, which can be charged with a wall outlet before you set out on your trip. You can then allow the sun to recharge it, although this does take longer. You are able to get one full smartphone charge, or 3 action camera charges. The charger has 4 LED lights, which can provide between 5 and 70 lumens of light. The light also lasts up to 200 hours, absolutely brilliant if you require an emergency light source or if your torch fails. 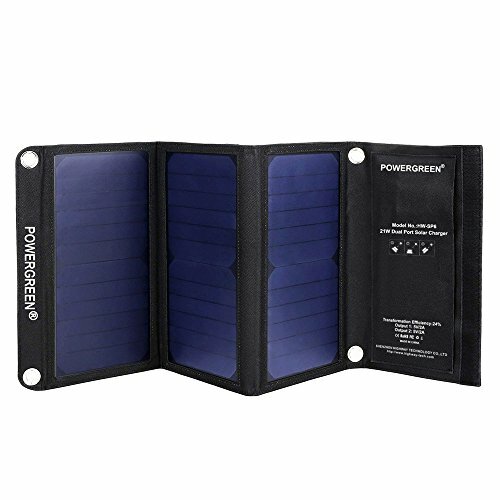 This charger from Powergreen is a 21W solar charger with a very high conversion efficiency. The panel has a monocrystalline design, which has a conversion efficiency of up to 24%, which is higher than most solar chargers. The device has two charging ports, which allows it to quickly and effectively charge two devices at once. The pack is also water-resistant, and the foldable design means you can protect the solar panel no matter the weather. The panel is made of industrial strength PET polymer, while the body and case are made a weather-resistant polyester canvas. Even though the charger is foldable, it is still slim and can easily fit into any pack for traveling. 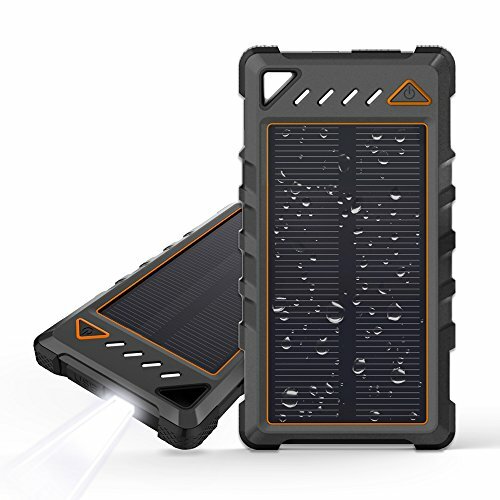 The X-Dragon Charger is a 10 000mAh foldable solar charger. The panel also comes with a power bank that allows you to store energy throughout the day, that you can then use to charge your devices during the night. The pack is made with an integrated Smart IC chip, which enables both charging ports to automatically adjust to the device that is plugged in to ensure it receives the right amount of power to allow for a quick charge without overcharging or overheating your gear. The charger itself is made with a leather sheath and ABS, making it highly resistant to wear and tear. The charger is also splash-proof and shockproof, and the foldable design protects the interior against damage. When buying a solar charger, there are a few aspects of the charger to take into consideration before making your purchase. Factors such as size, weight and charging speed are crucial factors to understand. Durability is one of the most important aspects when purchasing a solar charger. You are most likely going to be using it while traveling, hiking, camping, or any other outdoor activity. Therefore the charger needs to be rugged and tough. If you are planning on using this charge regularly while camping or hiking, the charger needs to be waterproof, as well as shockproof and dustproof. It needs to be able to handle being bumped, dropped, or having it fall into the water in the case of you dropping your pack. Having a charger that is versatile enough to charge different pieces of gear can be an incredibly useful feature. When you are out on a trip, you will have multiple devices with you, as well as different pieces of gear such as cameras or torches to charge. A solar charger that is able to charge phones, tablets, cameras and action cameras, lighting, navigation equipment, and whichever other pieces of equipment you will be taking with you. Having a charger that is an all-in-one will also save on weight and space. Being able to charge multiple devices at once is also a factor you will need to consider. Some chargers are only able to effectively charge one device at once, and if you are traveling in larger groups or have many devices you need fully charged at once, you may need to consider a big charger. You should also consider where and when you are going to need this charger, is it just going to be used to charge your phone after a long day on the slopes, or are you going to need it for multiple days and multiple charges while camping and with no access to another power source? The speed at which the solar charger charges your device comes down to personal preference. If you are having a relaxed weekend camping trip and you won’t be using your phone a lot, having a charger that is super quick maybe isn’t necessary. Once again, if you are by yourself and worried about your safety, and need to know you have a constantly charged phone or torch, a charger that can charge quickly is most likely the better option, be aware though, they can be a bit more expensive. Nobody wants to be lugging around a large charger with them that takes up an enormous amount of space in your pack or travel bag. This is where how portable the charger is becoming important. You will need something small and compact, a charger that is easy to fit into any size pack or jacket pocket. Finding the balance between size and charging power is not as difficult as you may think, and chargers that can do both are easy to find. In conjunction with portability, weight is also a factor. There is no use in finding a charger that is compact but weighs the same as a brick. This isn’t actually a common problem as most small chargers will also be lightweight, but you need to be aware of weight when shopping for larger capacity chargers. 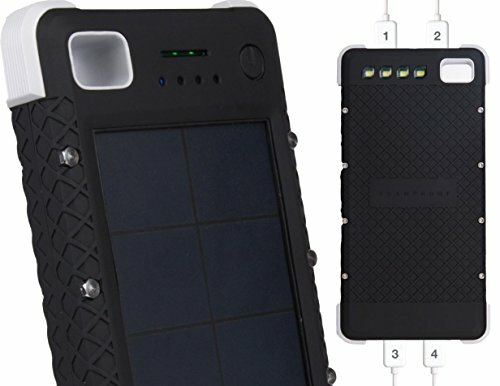 Almost every portable solar charger will come with either one or multiple USB connections. This is perfect for most devices such as smartphones, tablets, or action cameras, but be wary if you are looking to charge bigger pieces of equipment. If you are wanting to charge something you would usually plug into a wall, such as a camera or a laptop, you are going to need some sort of adaptor, as the USB connection will simply not charge the device. One of the most frustrating aspects of many solar chargers is the fact that they switch off and stop charging if cloud comes in. You will then need to unplug-plug in the device to restart it, incredibly infuriating if you have left a device to charge for hours, only to find out the charger switched off 15 minutes after you plug your device in. The way to stop this from happening is to find a charger that is made with “auto-restart technology’. Like the name suggests, this allows the device to turn back on by itself after the cloud clears. Another aspect to take into consideration is how many cables or adaptors you need. You will need to add in the factors of the conditions you will be staying in as well, as this will also help determine which panel you need. For instance, if you are going to be camping in the desert or at the beach, in the sun, you may want a panel that comes with a mesh bag or protective shade cover that will stop the sun from burning up your device. 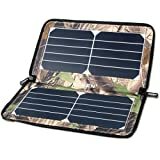 Conversely, if you are going to be camping in a really cold climate, you may want a solar panel with an extra long charging cord so that you can put your device in your tent while you charge it. It all depends on the situation you are going to be using the panel in. When it comes to solar panels and chargers, the wattage of the panel plays a huge part in the speed and efficiency at which the panels charge. The lower the wattage, the slower the charge, the higher the wattage, the faster the charge. Smaller solar panels, with a 4 or 5-watt output, can charge simple things like older phones or MP3 players. The issue is that most devices nowadays, especially smartphones, are a lot more power hungry, and require higher wattage chargers. If you are looking for a charger just to charge a smartphone, you will need a panel with a minimum of 7 watts of power output. If you are looking to charge devices that are more power heavy, such as a tablet, you are going to need a stronger charger. For more power hungry devices, you are going to need a panel with a minimum of 15 watts. Anything less will charge the device incredibly slow, or not charge it at all. If you are looking to charge a laptop, you will need an external battery and an inverter. Charging AC devices will take you into a whole new category of solar chargers. You are going to need a much more high power panel. A 25-watt minimum, a battery, and a DC to AC inverter. These are flexible panels that you are going to come across a lot when searching for a solar charger. CIGS panels are cheaper to manufacture and are much lighter and less bulky than other panels. The downside of CIGS panels is that they aren’t as strong as monocrystalline panels. This becomes an issue when you are in the outdoors, as these panels aren’t as durable and therefore more prone to breaking. Due to the integration of plastic, flexible fabric or other materials into the panels, the panels have the tendency to delaminate and degrade much quicker than other panels. They may be cheaper, but you get what you pay for. Monocrystalline panels aren’t as flexible and lightweight as the more modern CIGS panels, but they are not as rugged and durable as the monocrystalline panels. Definitely, a better option if you are going to be roughing it. Monocrystalline panels were traditionally quite cumbersome to travel with, considering they were quite large and bulky. Nowadays though, these panels are able to fold into a much more compact form, allowing for them to be stored a lot easier. CIGS panels are generally less efficient at charging devices compared to monocrystalline panels. The one difference between them though, is that CIGS panels tend to perform better in lower light and cloudy conditions. Polycrystalline and monocrystalline panels have one obvious difference, with the polycrystalline panels have a bluish hue, while monocrystalline panels have a more blackish hue. The significant difference between the two, as their names suggest, is the crystal content and makeup. Monocrystalline panels are made up of one solid crystal cell, while polycrystalline panels are made up of many smaller crystal cells. When it comes to solar panels though, purity will always outperform “growths”, meaning the single, solid crystal in a monocrystalline panel will almost always outperform polycrystalline panels. 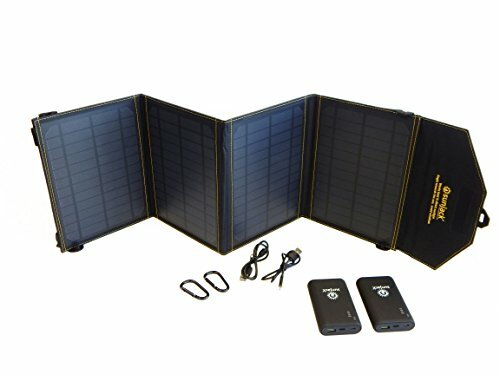 In conclusion, a portable solar charger is an incredibly versatile piece of the gear that every hiker and camper should have in their pack. Not only can one of these chargers ensure the batteries in your gear are fully charged, in an emergency situation, they can be lifesavers. If you are stuck without power, a solar charger is a difference between making contact with important services and being left in the dark. Many people have used solar chargers after an earthquake or hurricane. We highly suggest you invest in one of these solar chargers. Even if you are not an outdoorsman, having one, or even two or three of these chargers is a brilliant plan and should be a must in every household.